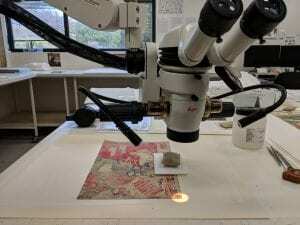 Over the past three months conservators at the Grimwade Centre for Cultural Materials Conservation (GCCMC) have been treating nine Japanese woodblock prints from the Baillieu Library Print Collection. This selection of colourful prints from the Edo period are to be used for teaching at the University of Melbourne in semester two, 2018. Conservation treatment therefore focused on improving the stability and visual appearance of the works for safe handling and display. 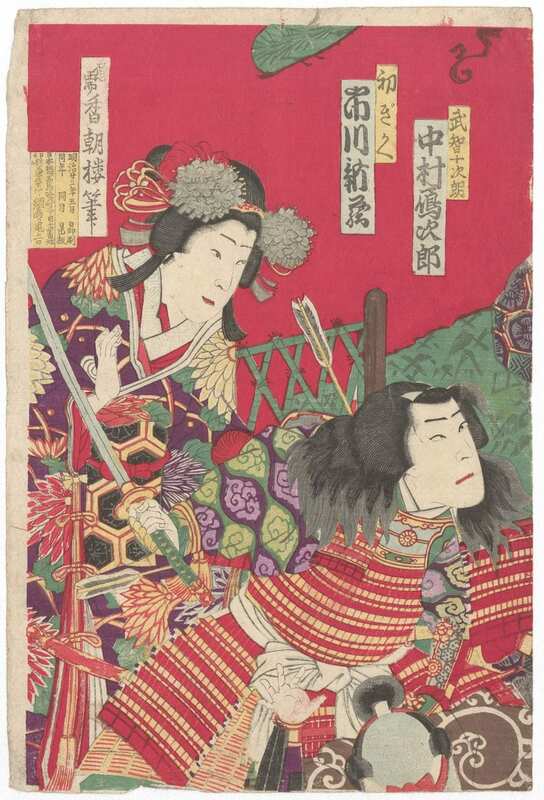 Utagawa Kunisada III, [Kabuki actors], (1891), woodcut, Gift of Dr J. Orde Poynton 1959. 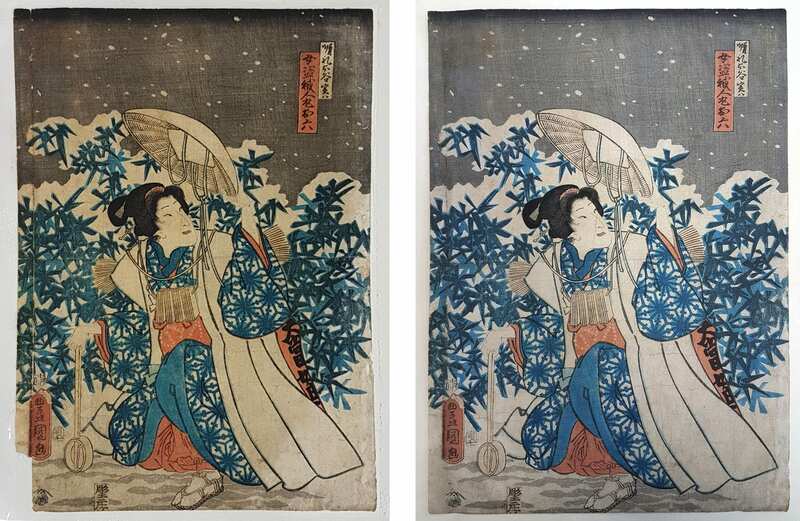 Japanese woodblock prints, both the commercially produced ukiyo-e and privately published surimono [1. ], often prove difficult during conservation treatment. 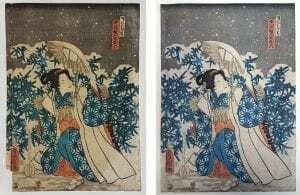 Ukiyo-e and surimono are usually printed on remarkably thin papers, comprised of long kozo, (Japanese mulberry paper tree) fibres which intermesh during the paper-making process to form a strong sheet. Despite the strength of such papers, their long fibres [2.] make them particularly sensitive to abrasion. This limits the mechanical removal of surface dirt. For some of the Baillieu Library prints, treatment was further complicated by the presence of water-soluble pigments and dyes, and areas of subtle embossing produced through blind printing. 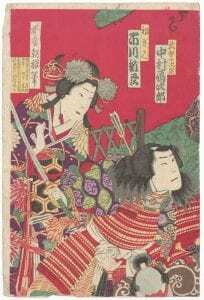 The print ‘Kabuki actors’ (1891) by Utagawa Kunisada (1848-1920), was particularly water-sensitive. In order to control the introduction of moisture, it was treated entirely under magnification. 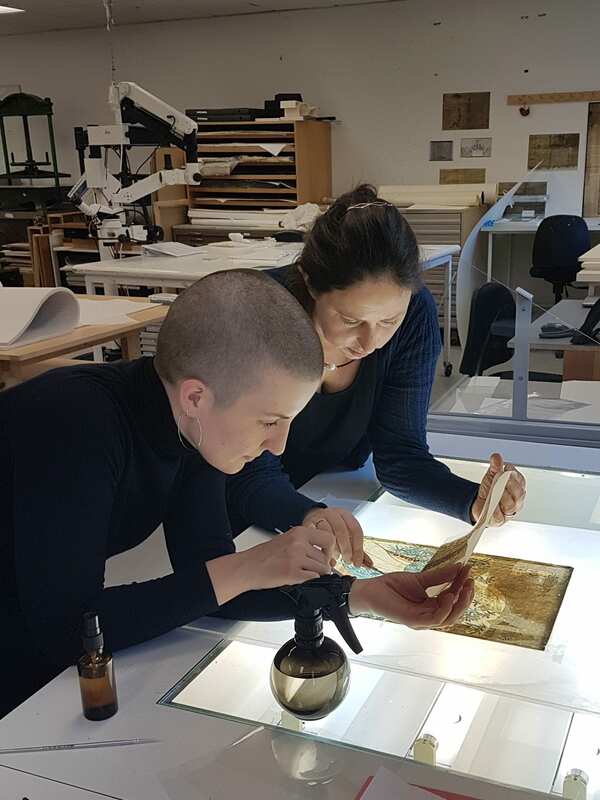 To reduce staining and discolouration on prints with more stable media, Grimwade conservators were able to undertake washing on the suction table. Before proceeding, comprehensive solubility testing was completed under the microscope with the selected washing solution, to ensure the safety of media and inscriptions on each work of art. For Kunisada Utagawa’s (1786-1864) Figure kneeling in a garden (18th century) and Kitagawa Utamaro’s (c.1753-1806) Umegawa and Chûbei (c. 1803), washing also hastened the removal of degraded lining papers and failing repairs. During washing, moisture softened the adhesive sufficiently to permit the gentle removal of linings and repairs with a septum elevator. 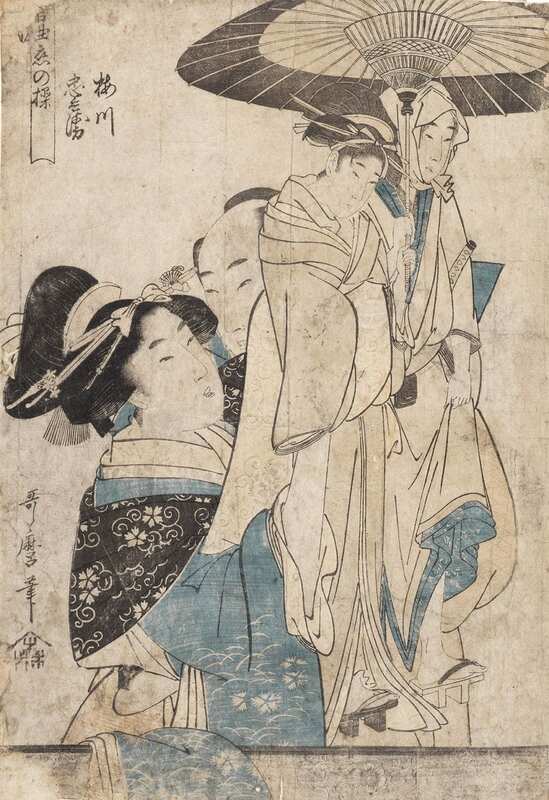 Kitagawa Utamaro, Umegawa and Chûbei, (c.1803), woodcut, gift of Marion and David Adams, 2015. After washing, small losses and tears were repaired using Japanese conservation papers of varying weights and colours. Like the printing papers used in Japanese woodblock printing, these repair papers are made from kozo fibre [3. ], and are thus very strong despite their light weight. Repairs were secured with wheat starch paste, and toned with pencils or watercolour paints to match the surrounding areas of the original print. For exhibition purposes, each print was hinged along all edges to an inlay paper for support, which was then secured along the upper edge into a window mount. To balance the demands of display with those of research, hinges along the left, right and lower edges of each print were fed through slits in the inlay paper but not adhered. This mounting method ensures that the Japanese woodblock prints remain secure for display, and fully accessible for research. These works will be utilised by students studying Japanese prints in the second semester subject, The Print Room. [2.] A particularly strong fibre made from Japanese mulberry, see Turner, S., 1998, The book of fine paper: A worldwide guide to contemporary papers for art, design and decorating, Thames and Hudson, London, p. 83. [3.] Mizumura, M., Kubo, T. and Noriki, T. 2015 ‘Japanese paper: History, development and use in Western paper conservation’, Adapt and evolve 2015: East Asian materials and techniques in Western conservation, proceedings from the International Conference of the Icon Book and Paper Group, London, 8-10 April 2015, pp. 43-59. Next Next post: Hey, Hey it’s The Monkees!